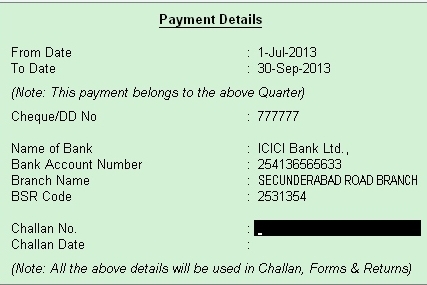 01.07.2013: XYZ Company received a bill from M/s.Designer Arts Pvt Ltd., for Rs. 3,00,000 towards Advertising Services provided charges. 03.07.2013:XYZ Company received a bill from M/s.Kanna Financial services Pvt Ltd., for Rs.52,000 towards Interest charges for Loan Account No.BD52145. 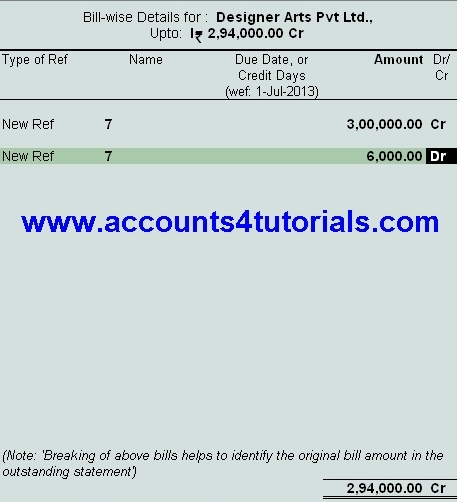 06.07.2013: XYZ Company received a bill from M/s.Digital A7 Pvt Ltd., for Rs. 1,50,000 towards Advertising Services provided charges. 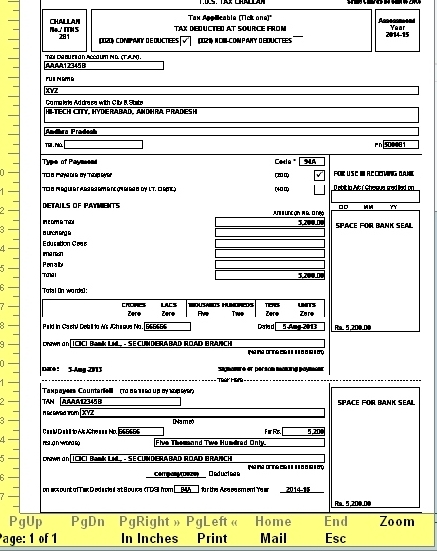 09.07.2013: XYZ Company received a bill from M/s.Indian Shipping services Pvt Ltd., for 60,000 towards C&F Charges. 16.07.2013: XYZ Company received a bill from M/s. Billa Publishers Pvt Ltd., for Rs. 1,80,000 towards Advertising Services provided charges. 05.08.2013: XYZ Company paid TDS (under section 194A) of Rs.5,200/- through ICICI Bank (Cheque, No: 666666) for the month of July 2013. 05.08.2013: XYZ Company paid TDS (under section 194C) of Rs.13,800/- through ICICI Bank (Cheque, No: 555555) for the month of July 2013. 05.08.2013: XYZ Company paid TDS (under section 194H) of Rs.4,000/- through ICICI Bank (Cheque, No: 777777) for the month of July 2013. Workings is very useful for better understanding about all Transactions. 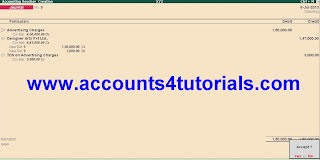 We request you to, kindly read working before start this tutorial. Read Workings. 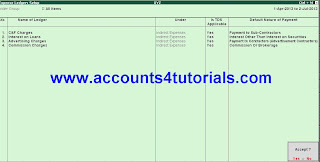 Create Expenses Ledgers: For the above Transactions, you will be create Four Expenses Ledger. So create another Two Expenses Ledger "Advertising Charges" & "Commission Charges". > Press Down Arrow till Last ledger. 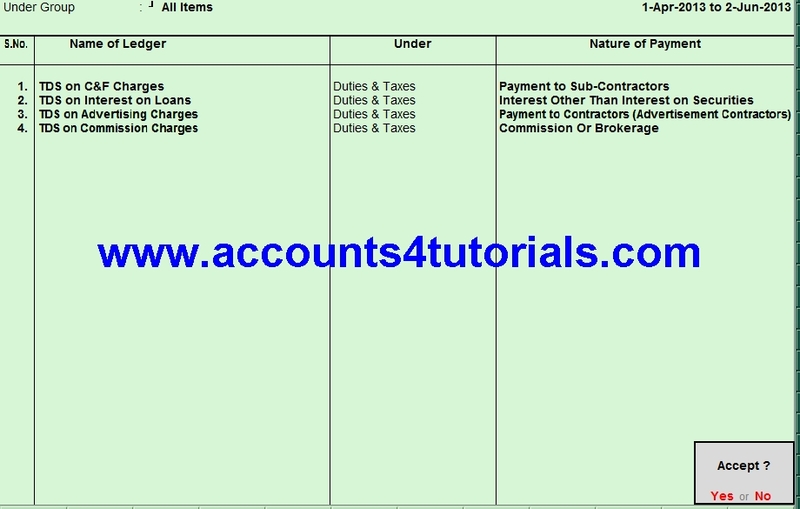 Create Tax Ledgers: For the above Transactions, you will be create Four Tax Ledger. So create another Two Tax Ledgers. 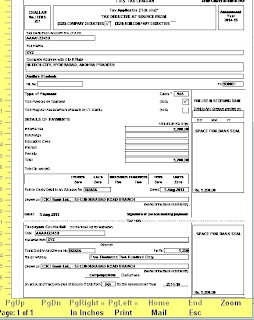 Create Party Ledgers:For the above Transactions, you will be create Six Party Ledgers. So create another four Expenses Ledger. Enter Journal Vouchers: You will be enter one Journal Voucher for one Transaction. In this Tutorial, there are six Journal Transactions. so enter Six Journal Vouchers. Cr. Designer Arts Pvt Ltd., 294,000. > Click on F7: Journal from right side panel / Press F7. > In Debit field select "Advertising Charges" from the List of Ledger Accounts. 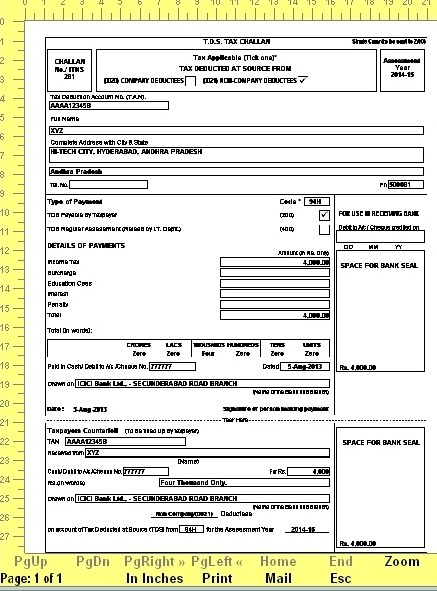 > Enter total Expenditure (Rs.300,000) in the Amount field. 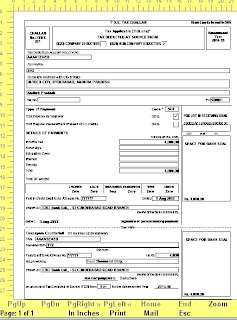 Now you can view TDS Nature of payment Details. 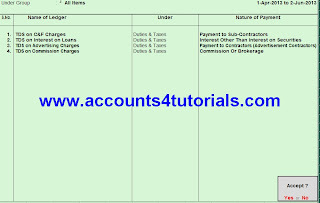 > Select "Payment to Contractors (Advertisement Contractors)" Enter Assessable Value Rs.300,000. 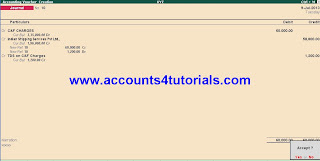 > In the Credit field select "Designer Arts Pvt Ltd.,"and press enter to view TDS Details screen. > Select New Ref from the Method of Adjustment. 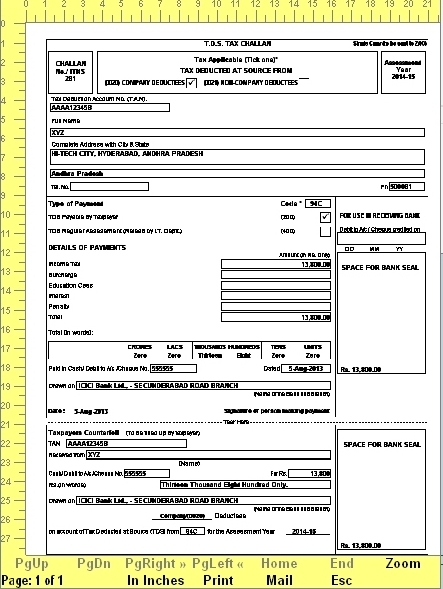 > Select "Payment to Contractors (Advertisement Contractors)" from the List of Nature of Payments. > Select "TDS on Advertising Charges" from the list of TDS Duty Ledgers. 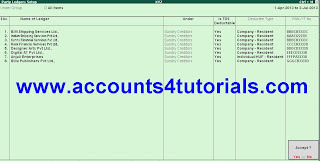 > Tally defaults the amount specified against the expenses ledger and skips the field. > User can set this field to Yes or No depending on the tax deduction. 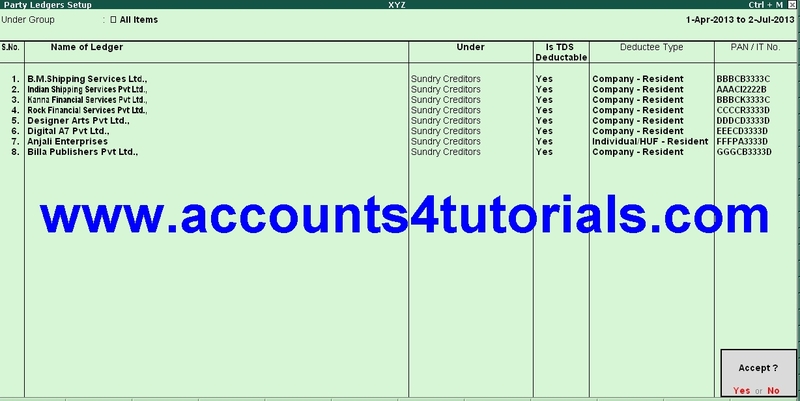 > TDS Amount field displays deducted amount & Payable Amount field displays the amount (after TDS). > Press Ctrl+A / Enter. > Skip the Due Date or Credit Days field. > Accept the default amount allocation and Dr/Cr. By default Tally.ERP 9 displays the Bill amount in the amount field as the credit balance. 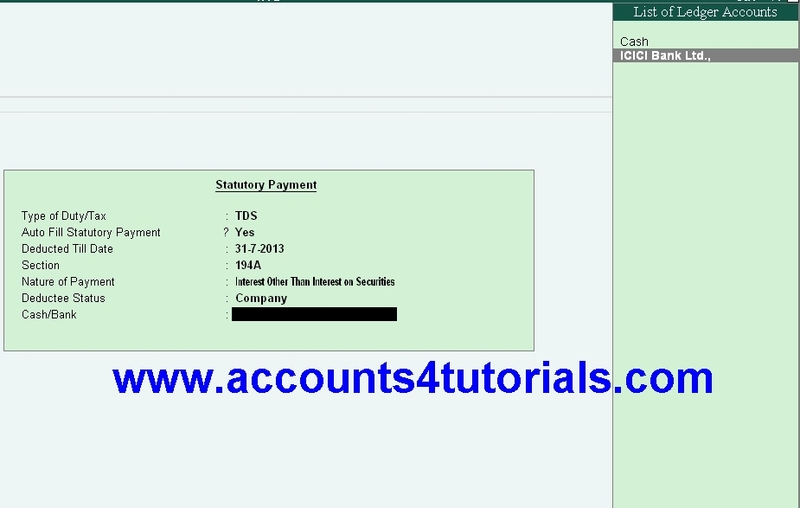 > Skip the Due Date or Credit Days field and accept the default amount allocation and Dr/Cr. 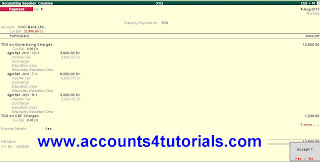 By default Tally.ERP 9 displays the Tax amount in the amount field as the debit balance. > Press "Ctrl + A" / Enter to save the voucher. 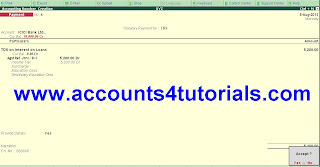 Enter Payment Vouchers: You will be enter Three Payment Voucher for above Transactions. 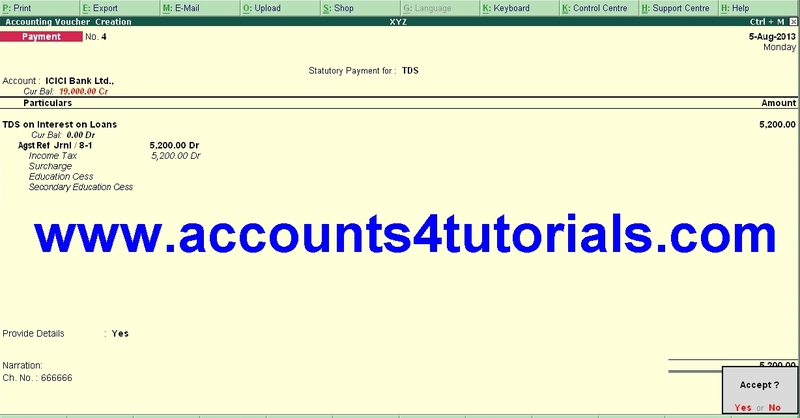 > Now Tally displays Statutory Payment screen. 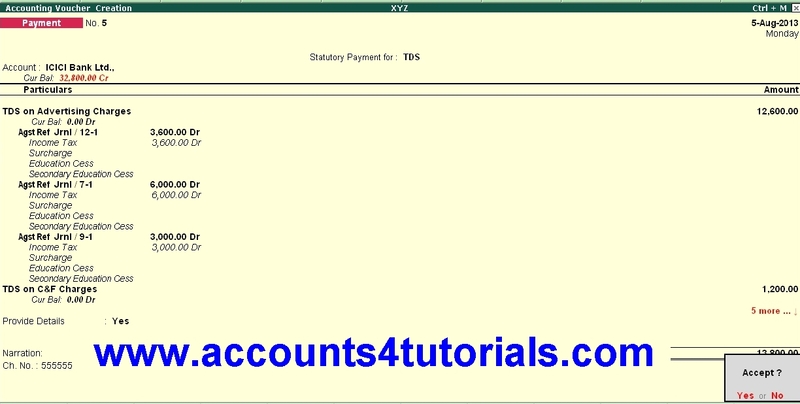 Select Types of Duty/Tax as "TDS"
> Auto Fill Statutory Payment: Set this option to YES to auto calculate and fill the duty payable to the Government. 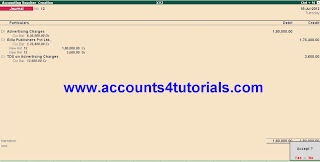 Set this option to NO, if the user wants to manually select the duty ledger and duty bills. 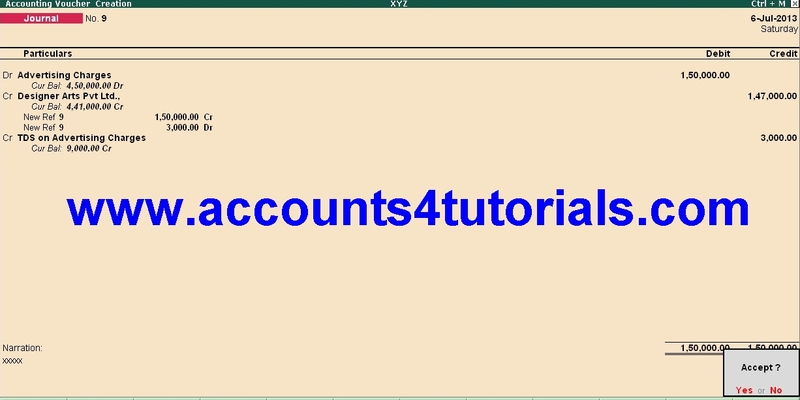 > Deducted Till Date: In this field user may enter, till date of the period for which the TDS values should be computed and auto-filled. Enter 31.07.2013. > Section: Select Section "194A Interest other than Interest on securities" from the list of section.As per the Act, separate TDS challans to be submitted for the payment of tax under each section. 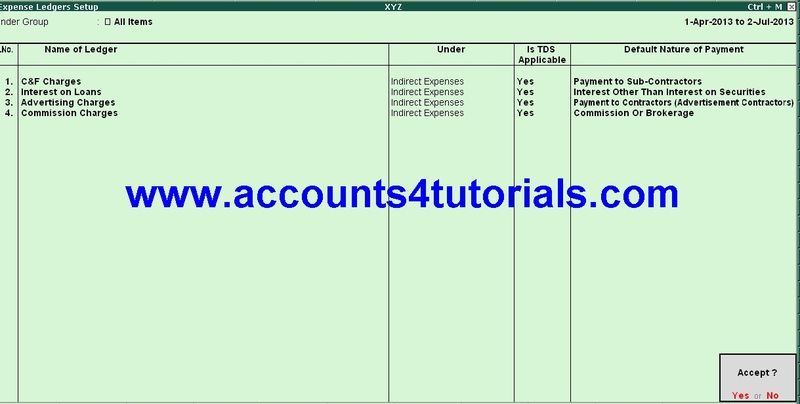 In this field, Tally.ERP 9 displays all the Sections under which, Tax deducted is pending for payment. 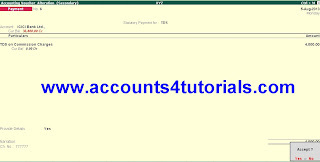 > Nature of Payments: Based on the section selected in the Section field, Tally.ERP 9 displays the section related nature of payments under which, Tax deducted is pending for payment.Select "Interest other than Interest on securities"
> Select Deductee Status as Company. > Select your Bank (Eg: ICICI Bank) from the List of Ledger Accounts. 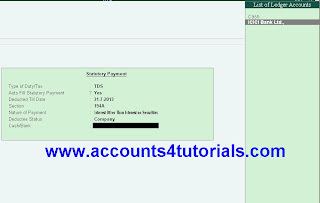 > The Bank Name through which the payment is made and TDS payable amount (with the respective bill details) will be auto-filled. > Provide details is Set to "Yes"
> fill Chque No,& Date. 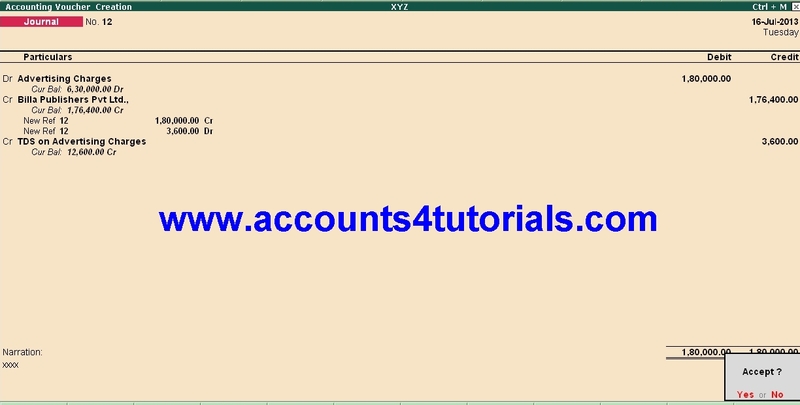 Automatically Tally displays Bank Account No, Branch Name & BRS Code. Because you have already update your bank account, when you create Bank account. Note: If the TDS payment challan details are not available at the time of recording the TDS payment entry, such details can be either by reconciling the TDS ledger or by altering the payment voucher. > Write Narration, then press Ctrl+A. 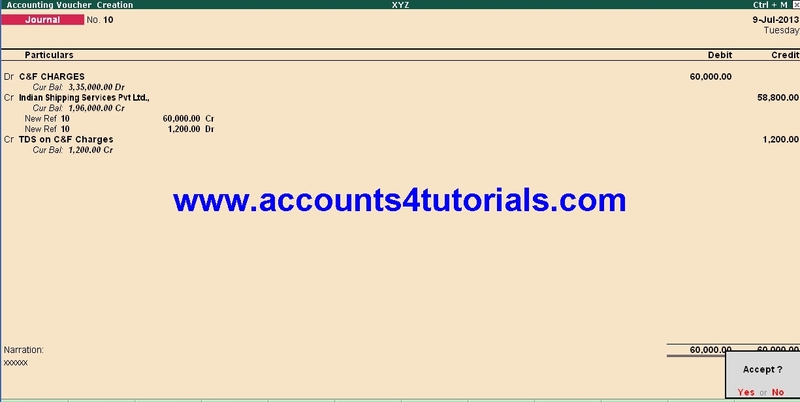 In the same way enter Payment Voucher No.2, Follow screen shots. 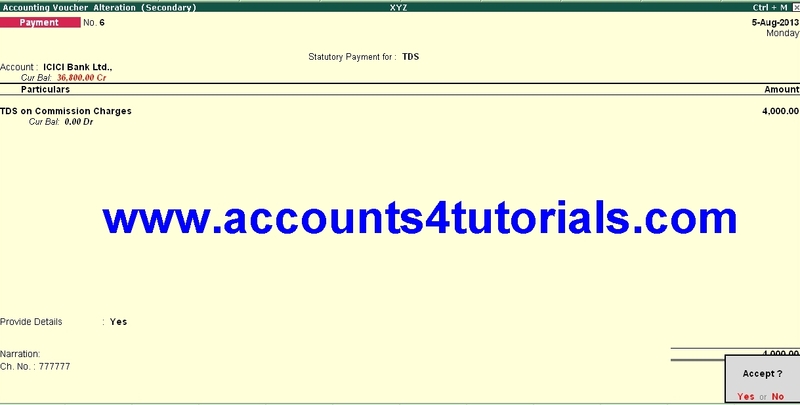 Nature of Payments: Based on the section selected in the Section field, Tally.ERP 9 displays the section related nature of payments under which, Tax deducted is pending for payment.Select "All Items"
In the same way enter Payment Voucher No.3, Follow screen shots. 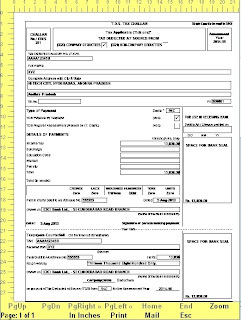 Print TDS Challan No.281: Tally automatically generate TDS challan for the above payment. Just Print this challans and submit it into your bank with related cheques. > Press F2: Enter the payment Date (05.08.2013), then press Enter. > From the list select, "TDS on Interest on Loans", press Enter. In the same way print remaining two Challans.